It’s no secret that we Americans are in love with our cars. They demonstrate our status and standing in society. The way we’ve invested in roads and highways and the way we’ve developed our cities pretty much mandates that you need to own a car to be able to access jobs, food, education and recreation. Driving a car has become the default mode of travel for almost all people for every trip of any distance. And here in Duluth, perched on a steep hill with prominent winters, it makes sense that people want to drive. So why would a person choose not to? Following the video, there will be a panel discussion with engineers, planners, and other experts in the area. Afterward, an informational tabling session will be held in the atrium where food and drinks will also be available. The event, hosted by the Healthy Duluth Area Coalition, follows a series of public meetings that were hosted throughout Duluth about one month ago. At each meeting, residents were given the opportunity to learn about ongoing and upcoming bicycle and pedestrian projects happening all over the city, including the Cross-City Trail, the Duluth Citywide Sidewalk Study, and the Duluth Traverse Mountain Bike Trail, and gave their feedback about their interest in these projects as well as other potential ideas. Over 50 residents participated in these meetings. 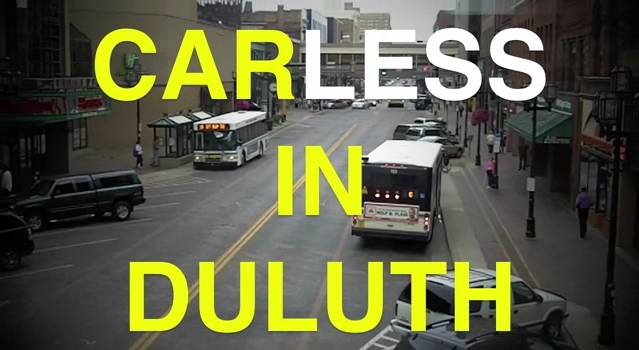 The Carless in Duluth premiere and transportation forum on March 20th will conclude this series of public outreach events. Organizations including the Duluth Transit Authority, the Metropolitan Interstate Council, City of Duluth Engineering, and the Bike Cave Collective have already confirmed their participation in this event, with pending confirmation from the Northern Lights Express, COGGS, and the UMD Cycling Club. Check it out – it’s free and open to the public.